Mar. 09, 2018, 5:20 a.m.
Stamatis Marinos’s first fish fry was the Skyview Volunteer Fire Company in West Mifflin during a visit to the Pittsburgh area more than a decade ago. Drawn to fish frys as an intersection of faith, food and Pittsburgh culture, he also loved how ubiquitous fish Fridays are in this area — even Arby’s has a fish sandwich. Marinos, who has worked on documentaries before, thought to himself that there should be one about fish frys. And that thought was in the back of his mind when he later moved to Pittsburgh in 2004. So in 2011, he set out to make the film himself. 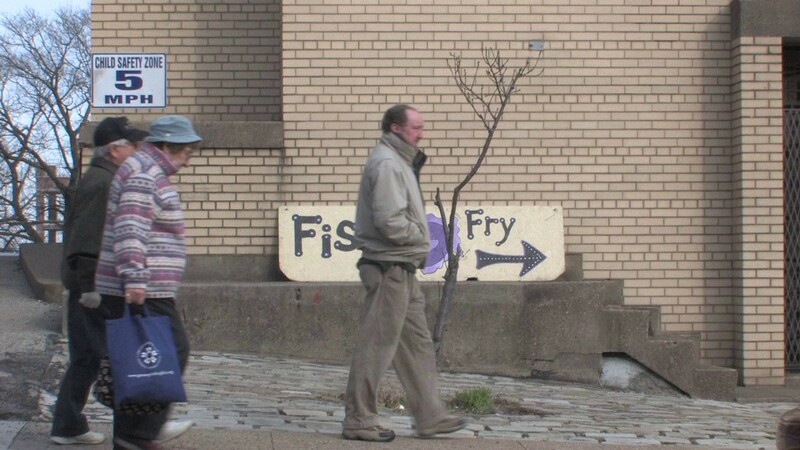 That year, he did the first round of filming and created a Google Map of locations, only to find the more popular Pittsburgh Lenten Fish Fry Map and meet its creator Hollen Barmer. Marinos did more filming in 2013. One of the hardest things as been tracking down when fish frys started, Marinos said. There aren’t good records of the meals as church fundraisers, but they really seemed to multiply in the late ’80s and early ’90s. Throughout the process, he’s been posting clips to YouTube and hopes to have the hour-long documentary — “Fish Fry Fridays: A Lenten Special” — done by the end of Lent this year. Marinos has filmed at two of the Ultimate Pittsburgh Fish Fry Final Four contenders — Ancient Order of Hibernians Division #32 in Carnegie and St. Mary of the Mount in Mount Washington. Marinos was interested in AOH because it’s an Irish-American Catholic fraternity organizing the fish fry, but the Ukrainian American Citizens’ Club of Carnegie provides the space. And the whole thing wouldn’t be possible without volunteers in their 70s and 80s who are producing large volumes of food each week, he said. Plus, AOH fish fry has ties to Riley’s Pour House, which is just blocks away and AOH’s competition in the Final Four. When Marinos filmed at St. Mary of the Mount, there was still a school, and Marinos said the generations of people working together is part of what stood out to him. Places like St. Mary’s and Our Lady of Grace (its competitor in the Final Four), which has a school, have a sense “of community, of continuity, of shared struggles and joys,” he said. Organizers for the two fish frys stressed the sense of community at the weekly meals. Patty Campbell, organizer of the St. Mary of the Mount fish fry, said even though there’s no longer a school, volunteers still range from 10 to 80 years old. So what can you expect from the documentary? The biggest overarching trend, no matter the fish fry, was the sense of fellowship, Marinos said. Even if it didn’t make that much money, the volunteers and attendees were connecting with their neighbors. Another theme? The food. Regardless of the fish fry and who is cooking, there will be haluski, pierogi and fish, he said. “It’s the Holy Trinity for fish frys around here,” he said. You know ‘em, you love ‘em, but just in case you need a refresher on the final four, here it is. Above is a map of the four locations. (Check out the interactive version here.) Vote here by 10 a.m. Monday, March 12. Fish Facts: Know for hand-breaded haddock and homemade haluski, the AOH fish fry is an opportunity to go to the usually members-only Ukrainian club. A majority of the funds raised are donated to various charities, mostly in western Pa. Fish Facts: Make sure to meet Father Richard Infante, who shares small glasses of wine with people as they eat hand-breaded fish and sides. Funds go back to helping the parish and there’s also an opportunity for attendees to donate to St. Vincent de Paul. Fish Facts: Choose from baked, fried or batter-dipped cod in a sizable portion. And eat in a pub that will make you feel like you’re in Ireland instead of Carnegie. Fish Facts: Go for the homemade pierogis. Volunteers make them in the off season, and the fish fry sells roughly 50 dozen per week, Campbell said. Also popular are breaded shrimp and haluski in addition to the fried cod.